The Master Compressor Extreme LAB 2, one of the most innovative watches from Jaeger-LeCoultre, is now available in a new version characterised by blue accents. The design instantly communicates that we are dealing with an exceptional watch. The 46.8 mm wide and 16.5 mm thick case is made of a titanium and vanadium alloy which provides more traction resistance than traditional titanium alloys. To make this watch even more resistant to scratches, it is fitted with a high-tech ceramic bezel. Pushpieces are coated with rubber grooves and also serve as a crown guard. The openworked dial with black PVD coated bridges allows the wearer to observe the details of the calibre structure through the sapphire crystal. The combination of cutting-edge materials and advanced horological research produced a timepiece which is absolutely remarkable for accuracy, reliability and endurance. The complexity of the Master Compressor Extreme LAB 2 is not perceived by the user thanks to the crown integrated function selector that handles various functions without involving the delicate operation of pulling out the crown. When the selector is in neutral position, the ceramic crown serves to wind the barrels. Functions can be sequentially selected by pressing the crown. One press takes the user to the position required to adjust the dual time-zone display positioned at 6 o'clock as well as the date. Another press switches the crown to main time-zone adjustment mode. And a final press brings the system back to its neutral position. A sophisticated manual stop seconds device can be operated using the slide located on the left side of the case. In the time-setting position the seconds hand continues running so that the precision of the watch is not affected. Anyhow, it is possible to stop the seconds hand by simultaneously sliding and pressing the slide. This is useful to ensure perfect synchronisation with a time signal. The handling in two phases – sliding and pressing – serves to avoid any accidental handling. 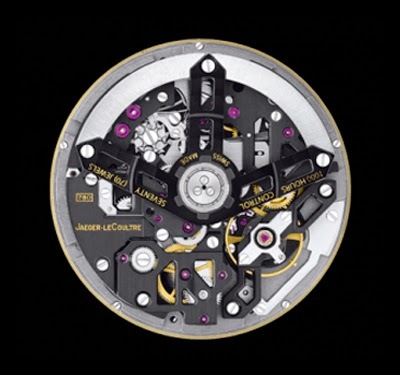 The Jaeger-LeCoultre Calibre 780 automatic movement beats at 28,800 vibrations per hour and features a column-wheel-controlled chronograph. When the chronograph central seconds hand completes one full turn, a large doubledigit counter situated at 12 o’clock instantly jumps to indicate the chronograph minutes. The chronograph hours totaliser is located at 9 o’clock, coaxially with the movement seconds. generally used to adjust the frequency of the balance eliminates the risk of a change in position if subjected to a violent shock. The balance-spring itself is fitted with a specific protective device that restricts its oscillation in case of shocks. The oscillating weight is mounted on ceramic ball bearings that require no lubricant, a solution that significantly enhances endurance. 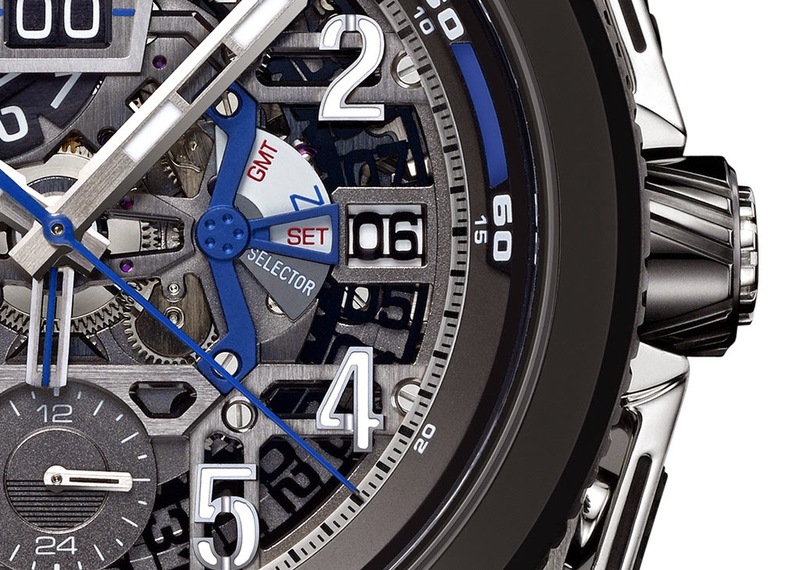 The barrel of the Master Compressor Extreme LAB 2 guarantees a power reserve of 60 hours. The level of energy available at any given time is intuitively indicated by a new patented radial display arranged around the rim of the upper dial section. 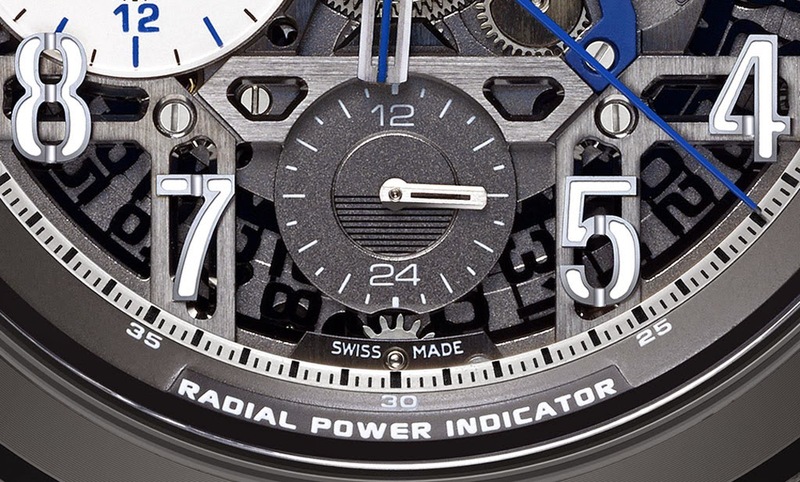 As the power reserve decreases, the segments on the semi-circular indication turn from white to blue. A fast strap-change system is incorporated into the caseback with a new double pin buckle that ensures a perfect fit on the wrist. 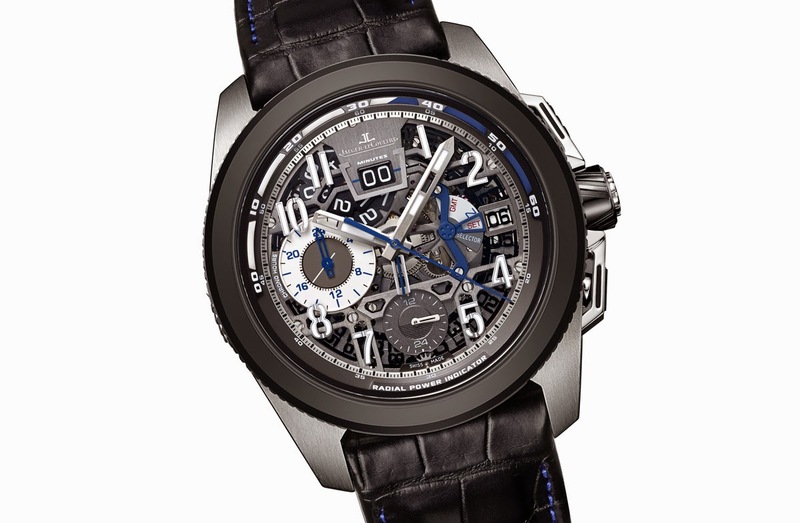 Jaeger-LeCoultre Master Compressor Extreme LAB 2. 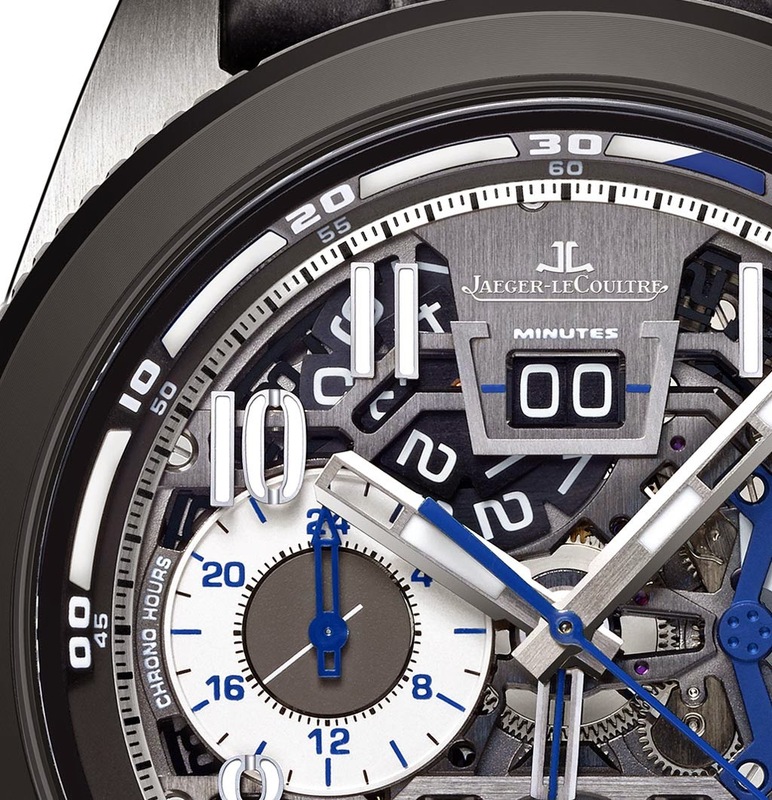 The Master Compressor Extreme LAB 2, one of the most innovative watches from Jaeger-LeCoultre, is now available in a new version characterized by blue accents. The case is made of a titanium and vanadium alloy providing more traction resistance than traditional titanium alloys. 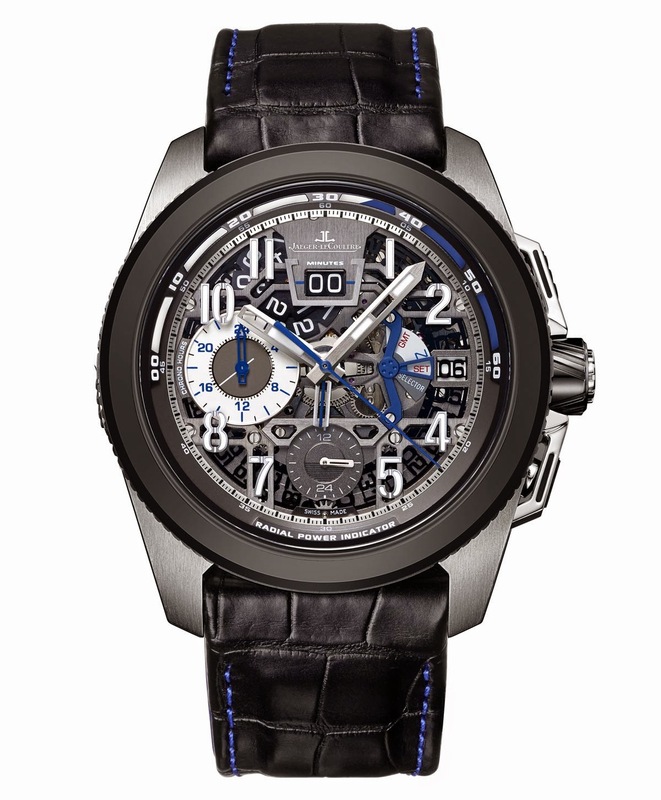 The new Jaeger-LeCoultre Master Compressor Extreme LAB 2 (ref. Q203T541) has an indicative retail price of Euro 47,000 / US$ 55,000.